Shows at the Broadway Theatre included "Guns for San Sebastian," "What's so Bad about Feeling Good?" and "Thoroughly Modern Millie," the latter of which was described as "the happiest motion picture of the year." Young members of the Estacada Seventh-day Adventist Church would be collecting canned goods for the less fortunate on Halloween. "There are 16 young people in the Estacada co-educational Pathfinder Club," said Gerald Hamman, the church's director. "Last year they collected 230 cans and 150 items of clothing. The goods are used to make up Thanksgiving and Christmas baskets for persons whose names have been supplied by friends and Neighbors of Estacada in Action Together (NEAT)." 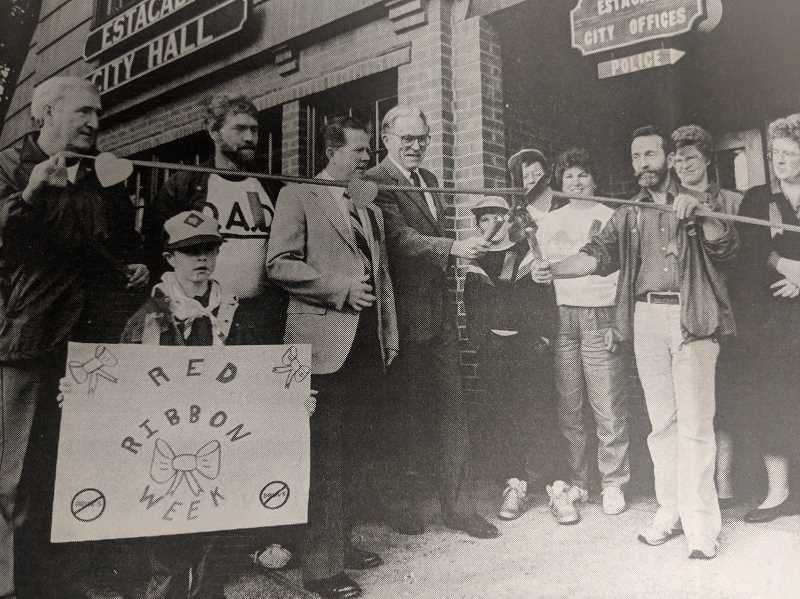 Several local groups joined forced during a ribbon cutting ceremony designed to promote a drug free society. The newspaper described Red Ribbon Week as "a week to observe and reflect about the life affirming value of living without drugs." During opening ceremony for the week, Mayor Tom Nelson and School Superintendent Bill Proppe cut the ribbon. Additional activities included a program at Estacada High School featuring local sports personalities, the school's drug awareness counselor and the Clackamas County Sheriff's Office. Students would also wear red ribbons throughout the week. Estacada Junior High School drama students were staging "Aladdin." The musical's cast included Brandon Wojden as Aladdin, Sophia Santulli as Jaffar, Jessica DeLazerda as the genie and Casey Housen as Princess Jasmine. In honor of Halloween, Subway was giving out trick-or-treat bags with the purchase of a children's meal. Jessie Guttridge, a 10 year old participant in 4-H, wrote a letter to the editor in support of a ballot measure that would support the organization and the Extension Services program. "Imagine the county fair without 4-H," she wrote. "People would wonder why the animal barns were empty. There would be no 4-H judging and the 4-H exhibit building would be locked and empty." Philip Foster Farm was preparing for its annual Halloween event. The haunted farm would connect attendees with volunteers portraying ghosts from Oregon's past, such as Charity Lamb, the first woman convicted of murder in the Oregon territory, and two cousins named Nancy and Mary, also known as the peach girls. After traveling west and upon arrival at Philip Foster Farm, the girls overindulged in peaches and died.